Quantitative information on fracture process can be obtained from acoustic emission (AE) technique. The critical stress intensity factors are effectively determined in the bending test of notched concrete beams, which are applied to the analysis of mixed- mode crack propagation by the boundary element method (BEM). AE waveforms are generated as elastic waves in concrete due to crack nucleation. Crack kinematics can be represented by the moment tensors, which are determined by SiGMA (Simplified Green’s function for Moment tensor Analysis) code. On the basis of the eigenvalue analysis of the moment tensor, AE sources are classified into tensile and shear cracks. Crack orientation is determined from the eigenvectors. Fracture process zone (FPZ) is created with the mixed- mode of tensile and shear cracks near the notch-tip not on a plane but in a zone, according to SiGMA analysis. Simulation of crack propagation of concrete is carried out by the two-domain BEM.The macroscopic crack extension in concrete is successfully analyzed on the basis of LEFM. The analytical results are compared with experimental results of SiGMA analysis. Fracture toughness is a material property, which can be defined as the critical stress intensity factor (KIC ), the critical energy release rate (GIC ), the strain energy density factor (SC ) and so forth. Fracture mechanics was first introduced by Griffith for brittle materials, such as glass. Since Kaplan applied the concept of fracture mechanics into concrete structures. Numerous researchers have applied to understand the modes of mechanical failure in concrete. It is realized then that the fracture process zone (FPZ) is created ahead of the crack as shown in Fig.1. As a result, the non- linear fracture mechanics (NLFM) was introduced instead of the linear elastic fracture mechanics (LEFM) (Hillerborg, et al., 1976). Although most efforts have been lately devoted to characterize the FPZ physically and mechanically, LEFM seems to be still useful for studying the failure of concrete. The maximum circumferencia stress criterion based on LEFM was successfully applied to trace the crack extension of mixed- mode cracking (Chahrour, et al, 1993). By employing the two-domain BEM, crack orientations were evaluated from the stress intensity factors of mode I and mode II. Fig 1: Fracture Process Zone in concrete. AE is elastic waves produced by a sudden internal stress redistribution of the materials caused by the changes in the internal structure, of which possible causes are crack initiation and growth, crack opening and closure, dislocation movement, twinning, phase transformation in monolithic materials, and fiber breakage and fiber-matrix de-bonding in composites. A typical waveform is given in Fig.2. Most of the sources of AE are damage-related. Thus, the detection and monitoring of AE are commonly used to predict material failu re. A typical AE system setup is given in Fig.3. Detecting AE events, nucleation of FPZ is possibly identified. Thus, AE is applied to estimate the critical stress intensity factor, KIC. Fig 2: The definition of AE parameters. Fig 3: A typical AE system setup. AE sources can be modeled by dynamic displacement motion. In the case of cracking, it is already confirmed that AE waveforms can be synthesized by the dislocation model (Ohtsu 1982). Further,crack kinematics can be identified by an inverse procedure. Consequently, crack kinematics are identified by applying AE-SiGMA analysis. Fig 4: Generation of AE waves due to cracking. Here l and m are Lame constants. lknk follows the summation convention. These components are schematically shown in Fig. 5. In Fig.5, normal component m11, m22, and m33 result in the dipole forces, while m11, m22, and m33 represent double-couple forces. Fig 5: Moment tensor components. Since the moment tensor is symmetric and of the 2nd order, the number of independent unknown mpq is six. To solve Eq.4, two parameters of the arrival time (P1) and the amplitude of the first motion (P2) are read visually from recorded AE waveforms, by displaying them on the CRT as seen in Fig.6. Fig 6: Recorded AE waveform. The location of the source is determined from the arrival time difference. Then, Eq.4 is solved to determine moment tensor component mpq. It is noted that, prior to the solutions, calibration coefficient Cs in Eq.4 should be relatively determined to compensate the sensitivity of AE sensors. In order to estimate errors of the moment tensors obtained by SiGMA, an error analysis was previously conducted, assuming location errors (Ohtsu 1991). It was then found that the accuracy of solutions was highly dependent on the geometrical configuration between the sensor array and AE sources.Furthermore, it was realized that the most errors could be introduced from misreading the first motions. To select reliable solutions, therefore, a post-analysis was developed. Theoretical AE waveforms at actual AE sensor locations can be synthesized by Eq.1. In the computation, the data of AE source location and moment tensor components determined by SiGMA code are substituted. For simplicity, full-space Green's functions Gij(x,y,z) are employed, taking into account the reflection coefficients Ref(t,r) in Eq.4 and the calibration coefficient Cs. Although another procedure was proposed (Go et al., 1984), the comparison of AE waveforms with theoretical waveforms at all channels is time-consuming and is not quantitative. Applying SiGMA code to theoretical first motions, AE sources of which crack kinematics in the post-analysis are in good agreement with those of the original SiGMA analysis are selected as reliable solutions. A flow-chart of SiGMA procedure is shown in Fig.7. Fig 7: Flow-chart of SiGMA procedure. Concrete specimens tested are dimensions of 10cmx10cmx40cm, which were cured in water for 28days in the standard room (20oC). Mixture proportion and mechanical properties are summarized in Table 1 and Table 2. The mechanical properties are obtained from cylindrical specimens of 10cm in diameter and 20cm in height at the age of 28days. Three-point bending test was cond ucted. At the age of 28days, a precracked notch of 3cm or 7cm depth with 1mm width was made by sawing at the center for type CC (center-notch under center- loading) specimen and at 5cm apart from the center for type OC (off-center notch under center- loading) specimen. Six AE sensors are arranged to cover the area of FPZ nucleated ahead of the notch as shown in Fig.8. Open circles indicate AE sensors located at the back face and solid circles are those on the front face. Fig 8: An experimental set- up for type CC and type OC specimen. Photo 1: Experimental set- up. A universal testing machine was employed for loading as shown in Photo 1. 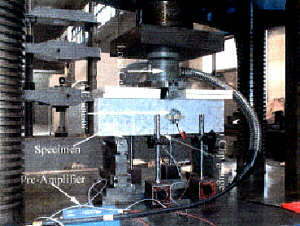 Load was applied at the top center as shown in the figure and was measured by a load-cell. Loading rate was controlled as 0.01mm/min for type CC and 0.02mm/min for type OC. Inserting a clip gauge into the notch mouth, the crack- mouth opening displacement (CMOD) was measured. AE sensors employed were of the resonance frequency 150kHz. For AE measuring system, the frequency range was from 10kHz to 1MHz and the amplification was 60dB gain in total. AE waveforms under crack extension were detected, amplified, filtered and recorded by using a LOCAN-TRA system (PAC). Then, a new interface boundary is defined from the new crack tip. The procedure mentioned above is implemented and crack propagation in arbitrary directions can be automatically traced. Fig 9: Configuration of BEM model. Fig 10: Configuration of crack extension. The relation l=2m/(1-2n) is applied, where n is Poisson's ratio. Setting shear contribution of the moment tensor as X, three eigenvalues of the pure shear crack become X, 0, -X, because lknk = 0. Fig 11: Unified decomposition of the eigenvalues of the moment tensor. where X,Y, and Z denote the shear ratio, the deviatric tensile ratio and the isotropic tensile ratio, respectively. It was pointed out that the ratio X could become greater than 1.0 in the case that both Y and Z are negative. It happens only if the scalar product lknk is negative. Recollecting the scalar product, the three ratios become well-posed. From solutions of Eq.8, AE sources for which the shear ratios X are smaller than 40% are classified as tensile cracks. AE sources of the shear ratio X greater than 60% are referred to as shear cracks. In between 40% and 60%, AE sources are classified as mixed mode. The configuration is given in Fig.12. Where, A1=-1.186, A2=2.474, A3=-6.858, A4=8.124, A5=0.045, and M is the moment. Computed KIC by Eqs.11 and 12 are compared and are shown in Fig.13. It is confirmed that KIC values are identically estimated for the ratio of a/W up to 0.7 from both equations. Kaiser effect is well known as an irreversible AE generating behavior under uniaxial compression. It results from the fact that cracks nucleated due to previous loading do not propagate until the load exceeds the former level in the next loading. However, limited success is reported in respect to the determination of the previous load level, because it depends highly on the loading path and history. In usual cases, AE activity under uniaxial compression is observed from low stress level. This is because the loading path is not identical to the previous path. It leads to a conclusion that some critical microcracks in a loading path normally propagate due to stress applied. When concrete contains a number of critical microcracks, active AE generation is expected from low stress level due to new crack propagation. In contrast, AE activity in concrete of few microcracks is considered to be stable and low at low stress level. Thus, the amount of critical microcracks in concrete could be evaluated by monitoring AE activity under stress. st is the tensile strength. The value of KIC was checked for specimen type CC with Eq.17. For 3cm notch depth, a>5.49cm, and for 7cm notch depth, a>3.06cm. Only the specimen of 7cm notch is satisfied with Eq.17. Thus the value of KIC of concrete is determined as 0.53MPa m1/2. Cumulative AE Hits vs Normalized Loads are shown in Figure 15 for type CC (3cm Notch) and Figure 16 for type CC (7cm Notch). Load versus CMOD curve by BEM is compared with that of the experiment of type CC in Fig.16. Because of good agreement, it is confirmed that KIC value is reasonably estimated for type CC of 7cm notch. Crack surface indicated by broken lines slant against the notches in the elevation view. Surface cracks are generated diagonally from the notch to the loading point, corresponding to the mixed-mode crack extension. In the figure, AE sources are plotted at their locations with directing the two vectors: l and n. AE sources for which the shear ratios are smaller than 40% are classified tensile cracks and indicated by an 'arrow' symbol. Other sources of the mixed-mode and shear crack are indicated by a `cross` symbol. It implies that FPZ is created near the notch-tip not on a plane but in a zone. The crack surface observed in Fig.17 was simulated by the two-domain BEM analysis. Comparison between crack trace by BEM and the theory of the experiment is shown in Fig.18. Reasonable agreement between crack trace analyzed and those observed are found. Crack extend slightly before the load reaches to the peak, creating FPZ. Thus, KIC was estimated at the stage right before FPZ, applying AE observation. FPZ is created with the mixed-mode of tensile and shear near the notch-tip not on a plane but in a zone, according to SiGMA analysis. Crack trace was simulated by the two-domain BEM analysis, applying KIC value determined. Thus, the macroscopic crack extension in concrete was successfully analyzed on the basis of LEFM.